Stanley Warren was sitting in the Staff Room of the Sir William Collins Secondary School one day in 1959. A colleague who was reading the Daily Mirror said to him, “Do you know anything about this, you were a prisoner of war”. Taking a look at the paper, Stanley saw a photograph of his mural of the Crucifixion. Having been told that his murals had been destroyed, this came as a shock to him. A couple of years later Stanley was contacted by the Royal Air Force, who had assumed the custodianship of the Murals, and asked if he would return to Singapore to carry out some restoration work on them. Stanley did not like the idea of doing this, as he feared the memories of captivity and cruelty which would be brought back to him. He had tried hard to forget his experiences, but now there was no chance of that. Fortunately, Stanley was able to overcome his fears and eventually returned to the scene of his captivity three times - in December 1963, July 1982 and May 1988. Stanley arrived in Singapore on 20th December 1963 for his first restoration work to the murals. He had with him most of the original sketches he made for the painting of the murals in 1942. Back in the Chapel after so many years, he sat down and wept. He could visualise the harrowing scenes of wartime and captivity, and the prisoners who died. When restoration began, only three murals were visible, The Last Supper, The Crucifixion and The Ascension. This contradicts the official stories of the rediscovery. Stanley said that he was, “absolutely amazed”, by the condition of the murals. Although the paint was beginning to lift and peel, much of the original paintwork remained. He quickly came to the conclusion that all the loose powder on the walls would have to be removed in order to provide a surface to work on. The walls were very carefully sponged down and fixed so that fresh paint could be applied. The mural of the Crucifixion had been damaged where a doorway had been made in the wall, later removed and the opening closed. This had been roughly distempered over again. Stanley had to redraw the feet of Christ and the lower limbs of the figures. The Ascension mural was also damaged. A line of holes was along it where shelves had been once fitted to the wall. In addition, the figure of Christ was faded and faint where paint falling from the ceiling when it was repainted landing on the figure had been washed away. On New Years Day 1964, SAC John Rankin, who was helping Stanley, uncovered the remainder of the mural of St Luke. Stanley did not have his original working drawing of the mural, so it was decided to leave the revealed section as it was. He felt that this showed how accurately he followed his original work during the restoration, “Nothing is being added to the restorations and nothing taken away”. During this first restoration, the mural of the Nativity was believed to have been destroyed. Stanley painted a copy from memory and an from old draft he had onto wallboard. This was hung over the wall where the Nativity had been painted twenty years before. Stanley made two changes to this copy. 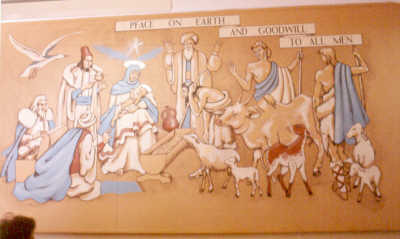 The wording was changed to read, “Peace on Earth and Goodwill to all Men”, and instead of a horse’s head on the left, an albatross was painted. The albatross Stanley felt was justified as this was a reproduction of the mural and reflected the use to which Changi was then being put by the RAF. This copy caused confusion in later years when ex-servicemen who had photographed the copy during their time at Changi saw the restored version with its differences. The photograph of the copy is courtesy of George Millar. George was one of those confused by two ‘different’ murals, both in the same place. Stanley returned to Singapore again in 1982 to continue his restoration work. The British had left Singapore in 1972, taking the copy of the Nativity Mural with them, and the Singapore Armed Forces had taken over the old RAF Changi. Nearby, the airfield which Stanley saw being constructed in 1943, was now Singapore’s civilian Changi Airport. Stanley was helped by three boys, Quek Tin Boo, Lim Hock Peng and Ravi Sangra from the Singapore Armed Forces Boys School and some of their officers. He spoke highly of the help that the boys gave him. The boys began working the wall on which the Nativity was painted on, and the horse’s head was the first thing to appear. Meanwhile Stanley worked on the preservation of the other murals. On 17th July, the boys uncovered the top half of the Nativity. This of course included the caption “Peace on earth to men of goodwill”. Stanley still intended to change the translation to that of the Authorised Version, “On earth peace, goodwill to all men”. Words he had wanted when he painted the mural and which he painted on the copy. In deference to history, he changed his mind and restored the mural with its original text. The main part of the mural was intact, but some of the lower portion of the mural was lost and had to be redrawn from the original sketch. As the original had been painted before Stanley was given the drum of grey pain, no grey was used in the restoration. The Chapel walls were also returned to their original old-gold colour. The murals could once again be seen as they were originally intended - with the figures moving along the chapel walls towards the altar. Ladies of the British Association raised money and provided a blue altar screen. Placed in the position of the original screen, it masked the windows and door at the end of the room and enhanced the look of the Chapel. In 1985, Stanley’s original sketch of St Luke in Prison was discovered in the memorabilia of Wally Hammond who had been a prisoner with Stanley. Working from this in 1988, Stanley painted a small picture of the mural. He was, by then, not fit enough to to take on the restoration of the mural itself. This painting is now kept in the Singapore Nation Archives. A copy is displayed below the remaining part of the original mural. Despite all that Stanley had done to forget the war, once he was named the painter of the murals, he was constantly reminded of it. He received letters about the murals from all over the world and some people would say how the murals had changed their lives. Stanley found this to be somewhat frightening for, to the contrary, he said the murals had made him humble. He once said, “I never know when they would constantly arise again. I now know there was no escape from the murals”. Stanley never saw the murals again after 1988. His work complete, he died in Bridport, England, on 20 February 1992. A former pupil of Stanley at Sir William Collins Secondary School, Shaun Hope, remembers Stanley. “He was Head of Art. We knew he had been a prisoner of the Japanese and he had a funny walk which we attributed to his brutal treatment. The story about his drawings appeared in the north London Press ca 1959. He was gifted at art and a natural teacher who just naturally commanded respect. He taught me how to draw and somehow succeeded in getting me a pass at GCE O level”. The Changi Murals were mentioned in the British Parliament in October 1968. Following the Labour Government's decision to withdraw British forces from Singapore, Charles Morris, MP for Openshaw, asked the Defence Secretary, Denis Healey, to consider moving the murals to England. Charles Morris kept the subject of the murals alive in Parliament. In November 1971 he asked about the murals being reproduced in the Garrison Church at Aldershot. His original hope of bringing them to England had been dashed by an adverse report by the Ministry of Works in 1969. The idea of reproducing the murals, with Stanley Warren as the artist also fell by the wayside. Lord Balniel, for the Government reported that the Singapore Ministry of Defence had decided to take over responsibility of the murals and to keep them in good condition for display. In addition, a copy of one of the murals, executed by Stanley Warren, had been brought to England and placed in the Garrison Church at Larkhill in Wiltshire. It would seem that this copy is no longer at the Garrison Church. If anyone can provide information on its whereabouts, please contact me.